After completing my successful Malerweg hike of May 2011, later that year my thoughts turned to planning another walk in Germany in 2012. For a few years, I had contemplated walking the Querweg between Freiburg and Konstanz as a prelude to visiting HamRadio at Friedrichshafen. This project never materialised because I had always returned instead to the Vorarlberg in Austria prior to the radio rally to enjoy walking in the Rätikon/Silvretta/Verwall Alps instead. Although the Querweg crosses a very scenic part of the Southern Black Forest, I was not convinced the long section through Hegau to Konstanz would be so interesting, as much of the landscape is flat, following farm paths past cultivated fields. 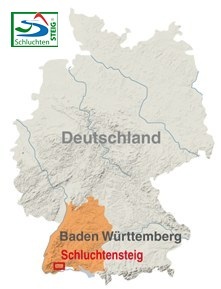 In 2008, the Schluchtensteig trail was opened, located in the southern Black Forest and was voted "Deutschlands Schönster Weitwanderweg 2011" by Wander Magazin. This trail takes one through the gorges of the Wutach, Gutach, Rötenbach, Haslach and Wehra along a succession of narrow paths with some tougher, rockier sections and regular ascents of a few hilltops. Various lookout points provide views of the gorges below, the mountains of the HochSchwarzwald and the Swiss Alps. This seemed a more attractive proposition than the Querweg. However, as the 2 trails coincide in the section through the Wutachschlucht to Blumberg, I would also be able to walk one of the highlights of the Querweg. The Schluchtensteig trail can be completed in 6 days, however having allocated 8 walking days in May 2012 for this walking holiday, I decided that after completing the trail, I would spend the last 2 days based in Hinterzarten. From this convenient base, I would be able to walk through the Ravennaschlucht, which is part of the Querweg and also climb the Feldberg, the highest point in the Schwarzwald. As before, when planning my Rheinsteig and Malerweg trips, I bought the excellent Hikeline guide and PublicPress map to plan the trip. After studying the guide and map, with some help from the Schluchtensteig website, time was spent looking for suitable accommodation then poring over transport timetables to ensure I could link up the sections to the available hotels and pensions. When I had completed booking of all the accommodation, further research determined the most convenient airport was Basel. The only flights to Basel in early May are from either Heathrow or Gatwick. Flights by Swiss from London City, my most convenient airport, do not start until May 21st. Both the Easyjet (Gatwick) and Lufthansa flights depart at very inconvenient times, which left British Airways as the preferred carrier. Fortunately, I was able to use some of my BA Avios points, so the return flight to Basel only cost me £27 in total. Train tickets were also ordered online from Deutsche Bahn, 91 days before the actual journeys, to take advantage of the advance booking discounts. 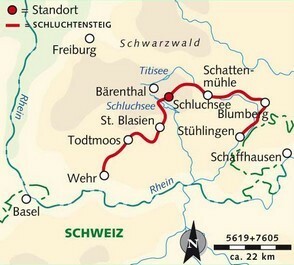 I flew to Basel on 4th May 2012 to start on the trail the next day.